I have the leather and artificial sinew even rivets. My problem lies in the shape and more important the fact it's handle heavy. I've tried couple of times and it just wanted to flop out. If I make a dangler I can't reach inside to grip the handle and pull it out. Any ideas? I thought maybe a blade cover that snaps to the notch in the handle might be the best solution with a lanyard in the handle to carry. I recently bought a worksharp grinder and LOVE it. Not the Ken Onion edition but it's still amazing. Now I want to carry this thing on every outing. 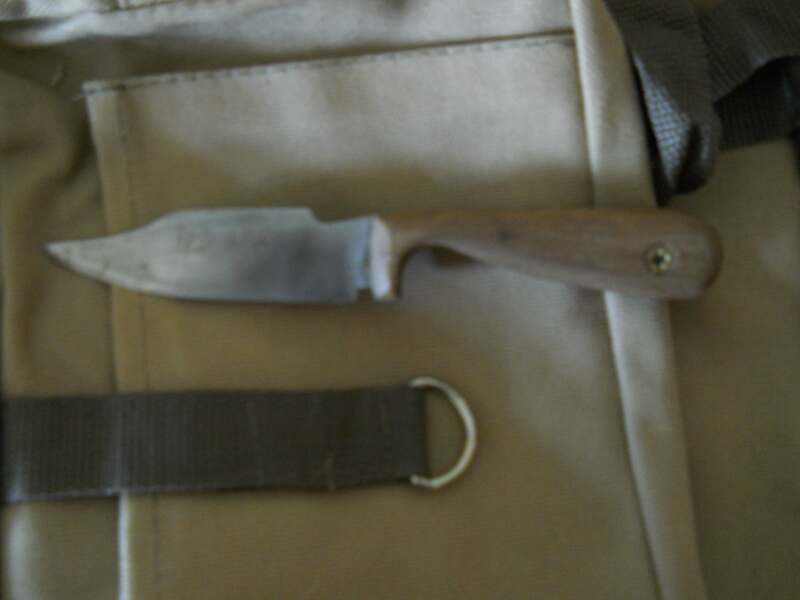 Judging from the picture this is not a big knife, the sheath design of any belt knife is usually influenced by the shape and size of the blade, In my opinion a simple pouch sheath made of 8~9 ounce veg. tanned leather that is wet molded to the knife and made to fit close and tight to the body would make for a nice EDC carry. I agree with Moe about a pouch sheath. Have a look at Grohmann Knives and look at some of their sheaths for inspiration. what type of leather do you have? new veg tanned, of recycled. Yep, the way that handle is shaped near the blade, it should provide plenty of bite / retention if you wet form a pouch sheath. I bought a bag of micellanueos scraps from our hobby lobby. So wet form it and leave an inch of handle above the sheath? Thank you. I'll Check those sheaths out. Got to be vegetable tanned or you won't be happy with it. The only leather I am aware of to avoid is chrome tanned leather. Given where you bought the leather scraps/pieces you can do a couple of tests to see if it is chrome tanned or vegetable tanned. Here is a link to the tests: The tests are towards the bottom of the page. cool. Definitely not veg tanned. It curled into a c shape, then straightened back out then sunk to the bottom. Most times you can tell just by looking at it, chrome tanned leather usually has a line of white showing between the layers of top grain and bottom grain leather at it's center. Chrome tanned leather can't be molded, and if it gets wet it leaches out the chromium chemical and will rust your tools, also if you make mocs or clothing out of it and it gets wet the leaching chemical will burn sensitive skin. I've bought veg-tanned leather belly sections a few times at Hobby Lobby. They are about 12" wide and 3' long, come rolled up in a mesh bag. Really nice, pretty leather. The regular price is a bit expensive ($29 I think) but I've found them on sale for 40% off or you might find an online coupon for 40% off. Even you you pay a relatively high price for a small amount of leather and manage to make what you need- upon success; you'll be years, maybe a lifetime ahead of ever needing a new one. The trouble, imo, with high price leather is the learning curve of learning leather. if you paid 10-12-15 or whatever it takes to buy a premium square foot of hide, then at least when done making any number of mistakes- you'd know what to expect. If, on the other hand, you try to make things from bags of scrap all you may learn is why those parts of hide are scrap.